Thoughts, ideas, criticism about cars. Interesting news and facts from the world of the automobile. Events in Italy and Modena. What you can find elsewhere, filtered through the eyes of a discerning enthusiast. Design, style, everything on the chopping block. Nobody is safe anymore. 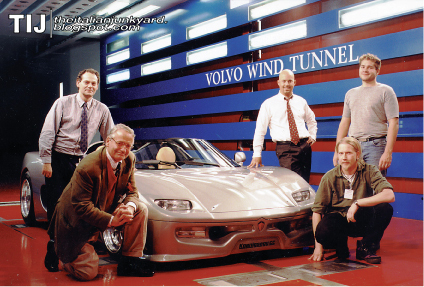 A few months ago I found a Swedish website reportedly explaining how the Koenigsegg automotive company started life back in the nineties. After posting a link and some of the images in the Pagani forum I’ve already mentioned about and where I’m a moderator, everything seemed just fine. About two weeks ago, Mr Christian Von Koenigsegg himself wrote me an email informing me that wasn’t exactly how things went. Now if you think about it, it’s weird enough that a company founder and CEO would take the time to contact a random guy to check on what he wrote about the company. It’s even weirder when such company produces cars so expensive that 99% of those who will read what that random guy wrote, won’t even be capable of ever buying such a car. Being an engineer myself, I’ve noticed far too many times that companies are often much too focused on sales and market shares rather than on their own products and image. Meaning that BMW is delivering ugly fat cars only because that’s what the market wants, regardless of what BMW may or may not be capable of producing and let alone paying attention to how many future customers they are losing. I’m pretty sure BMW, did its calculations right, figuring not only they’ll manage to sell a lot of X6 SAVs now but also in the future, yet I won’t be buying any of their cars anytime soon, assuming money is not a setback. At the same time, it’s my personal opinion that Ferrari isn’t paying enough attention to its fan base, avoiding official commitment to small and local events even though they are not only capable of affording the attendance fee, but probably of sponsoring the whole event. Granted, it is unlikely for them to hook a potential customer at these smaller venues, but they have surely lost out on the surefire sales of Ferrari accessories and extra gadgets that make up their large merchandising business. Then again if a small and exclusive company like Pagani basically shows up at every possible event in Italy, not getting even just 1 € back, I guess everybody else can. And this is specifically my point here chaps. You produce hyper exotics cars in a cold country up there in northern Europe, your name is very famous among true enthusiasts yet there are people who have yet to figure how to pronounce it, and the speed of your car is only surpassed by the rate of which my bank account will dry up at the moment of purchase. Yet, you contact this Mr Junkyard person in Italy, to make a point your car company is nothing less than a dream come true and that you and only a handful of friends are responsible for it. Mr Koenigsegg, you just got my respect. We’ll talk about my bright white Agera in a few decades though. So back to the reason why I’m telling you this, Mr K (can I call you that?) started his company back in 1994, way before any of us could get a glimpse of that egg shaped whitish rocket. 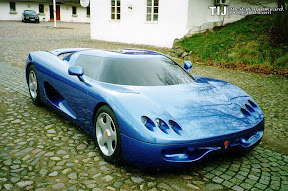 The foggy website reportedly mentioned one man named Svenharry Åkesson, who was responsible for the design of the first prototype, later purchased by Koenigsegg. The car was going to be named Sethera Falcon, and was featuring a tubular steel chassis. It actually was the other way around. 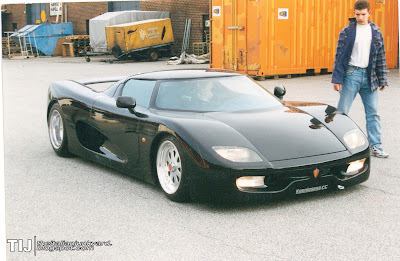 Mr Koenigsegg already designed the first CC model, on paper in 1994, and a 1:5 model was built by himself and friend David Crafoord. Subsequently Mr Åkesson was commissioned to build a full scale model, still based on Mr K’s design and on his behalf. You can even see what looks like a 1:10 model in the background, based on the original design. That was 1995. Eventually Mr K and his team took over the full scale model, modifying it according to the original idea and to the evolution that the CC was already undergoing in his creator’s mind. The steel chassis featured in that article was eventually purchased by Koenigsegg himself, that’s correct, but it was never used in any car. To put it to some use, this steel chassis was eventually used as a support structure for a full scale clay model. 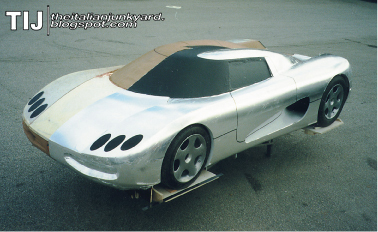 Just one year later, in 1996 the full scale model was used to create the tooling to produce the very first CC drivable prototype, tested by Rickard Rydell as you can see in this picture. 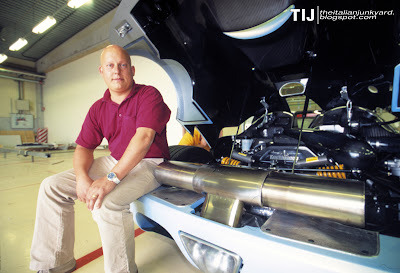 The chassis was once again designed by Mr Koenigsegg himself and by Dag Bölenius. A very similar second prototype was built and painted black. The whole project was still completely developed in-house. A prototype was produced but things weren’t ready yet. 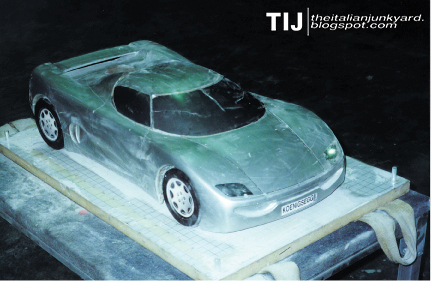 In order to improve the overall project, they built a new full scale clay model with improved aerodynamics and design, specifically referring to the height of the tail, roof air intake, new headlights and more importantly the targa roof itself. 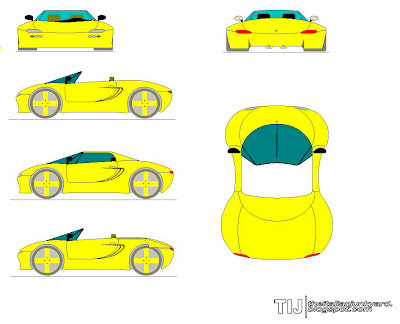 Managing to fit the hardtop in the front compartment was a major challenge, especially because this time the roof was made out of one single piece of carbon fiber, while another car with a similar feature, the Porsche Carrera GT, went for a 3-piece roof solution. 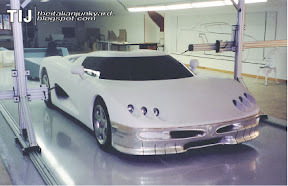 Eventually, the new CC prototype was still capable of 120 liters of luggage volume, the largest available on any supercar according to the factory. Once this model was readied in 1997, they started making models of each part, and building the tools for them. At the same time they were developing the chassis and the new suspensions, between 1996 and 1999. During this process the 180° 12 cylinders was scrapped in favor of a V8 which was based on an engine from the Ford modular family, albeit heavily modified, with dry sump lubrication, stronger internals and that marvelous thing called supercharging. 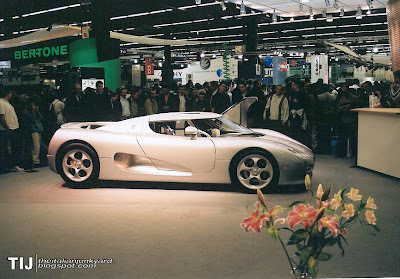 Eventually, it took until the year 2000 to have the Koenigsegg CC ready for its maiden debut at the Paris Autoshow, and another 2 years were necessary to gain the European certifications. In this time frame, the car was tested in extreme environments and on various race tracks, while also undertaking the mandatory crash tests. Yes, supercars are crash tested as well. It’s painful but necessary. Two year later in 2004 the CC8S evolved into the CCR. Among various technical updates, the CCR got new brakes, shock absorbers, a redesigned interior and bodywork, and more power thanks to a modified supercharging system. The chassis was still the same and proved to be up to the task giving Koenigsegg the official speed record for production cars in 2005, with a top speed of 388,87 km/h clocked on the Italian test track in Nardò. Stay tuned to know what happened next, part 2 is coming soon! Special Thanks to Christian Von Koenigsegg and Josephine Winger-Lang for the rare pictures they provided me. christian has inspired me make my own car company called IBARRA. which i would hopefully do in about 11 years or so. :) thanks for the info and by the way you should of mentioned what materials he used for his first prototype. Hi there and thanks for the comment. I didn't mentioned any material because in all honesty I didn't ask about them and he didn't mention them. Then again I don't think those involved in structural parts were that different from those used for the first production cars. No English? No problem! TRANSLATE!!! Want to contact TIJ? Send us an email! +/- Good sites to waste your time - click to seem them all! Home of the Pagani Zonda and Huayra, you'll find it here first! NCS - Don't miss the new entries! What we've ranted about, #HASHTAG!